Composer of acoustic, electro-acoustic and interdisciplinary works, Joseph Waters belongs to the first generation of classical composers that grew up playing in rock bands. These roots coalesce in an expansive aesthetic trajectory that explores connections between European-African hybrid genres such as drum & bass, metal, hip-hop, salsa, reggae, be-bop, ragtime, etc. with older strains such as Euro-centric classical and Gypsy music. Waters performs on laptop in SWARMIUS ensemble, with SDSU Professor SAXIMUS (aka Todd Rewoldt — classical saxophone) and a select group of world class virtuoso instrumentalists and singers. Together, the members of SWARMIUS humbly seek to create a hip classical music of the present, that combines the harmonic, contrapuntal and formal sophistication of the European masters with the rhythmic subtlety and complexity of the African masters. SWARMIUS performs Waters’ compositions throughout the world and has an music available on iTunes, Pandora, Amazon etc. Dr. 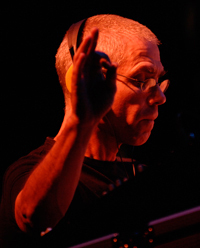 Waters is Professor of Music and Coordinator of Composition Studies — Acoustic and Electro-Acoustic, and runs the Electronic Music Studio, the Digital Recording Facility, and the Computer Lab. In addition to his activities as composer and teacher, Dr. Waters is Artistic Director of NWEAMO (New-West Electronic Arts & Music Organization). NWEAMO organizes an annual international electro-acoustic music festival whose aim is to foster connections between the classical electro-acoustic avant-garde community and the community of composers working at the experimental fringes of popular music.